Well, I score about 11 on their list. 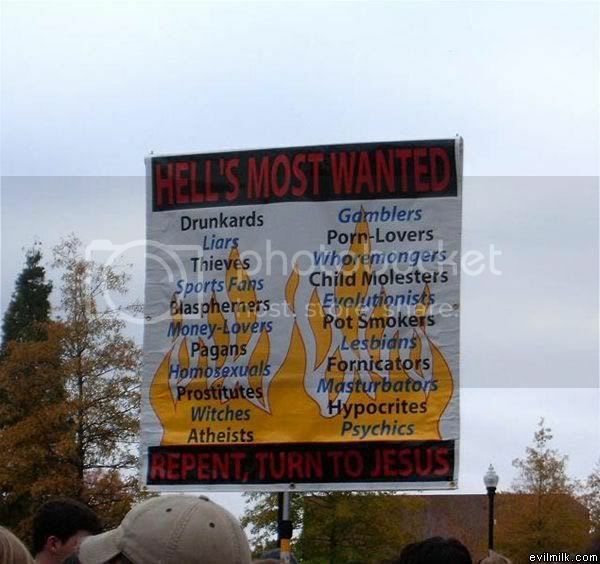 Odd that they missed off abortionists. And murderers. Maybe they don't *actually* know what lesbians are, just that they're supposed to be against them. Oh yes, the concept of Original Sin. We're all born as sinners because Eve ate an apple 4000 years ago. It doesn't matter what the human race has done in the meantime. God has decided we're all going to be sinners because of what Eve did. Sports fans?? Do all balls belong to Satan?? Doesn't explain why they also detest badminton though. Oh, wait, maybe that doesn't need an explanation. Well, I'm pretty sure the type who would wave this sign around owns at least one gun, so there's a good chance they might. Snap! I score 11 also. Wow. It's almost like doing a purity test again, only quicker. Damnit - don't go and start liking sports just to increase your score. It's not worth it! I think I get 17, based on everything I've ever done, since I probably count as a homosexual lesbian to these guys X-D. Not bad eh? I'll dig out the burn lotion! Oh... Those probably weren't two of the 11, eh? Yeah, I score pretty high on the list too.